On 24–25 October 2017, at a meeting in Astana, Kazakhstan, the WHO Country Office, together with WHO Europe and the Schools for Health in Europe (SHE) network, carried out the final activities of the Health Promoting Schools (HPS) pilot project. 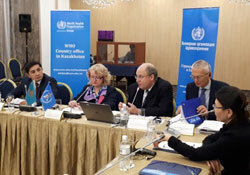 The aim of the meeting was to share the results of the project on Health Promoting Schools and School Health Services in Kazakhstan 2016–2017, to assess its success and to discuss next steps for a national strategy and accelerated actions to strengthen the school health programme. The project involved partners from 6 pilot schools in Kyzylorda and Mangystau regions, Astana and Almaty, as well as the Ministry of Health, the National Centre for Healthy Lifestyle, and local health authorities. During the project, a Health Behaviour in School-aged Children (HBSC) survey was conducted among pilot schools. The results of the survey were presented during the event and provided crucial health-related data on young adolescents (11–15 years old). This data will be extremely relevant for policy decisions and strategy development. The first day of the event focused on the evaluation and monitoring of the initiative. This was the opportunity for pilot schools to present the results of actions on promoting health and well-being completed in schools so far, and plans for the continuation of activities at the school, city, region and national levels. With the support of the Ministry of Health and the Ministry of Education the second day was dedicated to the final conference of national stakeholders. Stakeholders included the Ministry of Health, the Ministry of Finance, the National Centre for Healthy Lifestyle, the United Nations Population Fund (UNFPA), the SHE network, Nazarbayev Intellectual Schools, the Trade Union of Education and Science of the Republic of Kazakhstan, Kyzylorda Youth Health Centre, Mangystau Health Centre for Healthy Lifestyles and the health promotion pilot schools. A discussion was held on the outcomes of the pilot programme in Kazakhstan. The Russian version of a school manual developed by the SHE network was presented and a potential adaptation for Kazakhstan was discussed. The project took place under the framework of the Joint Programme of United Nations Agencies and the Government of the Republic of Kazakhstan: “Improving the well-being and quality of life in the Kyzylorda and Mangystau regions through innovative approaches to delivering economic, social and environmental services to the local population, including those most vulnerable”, in collaboration with the Ministry of Health.